87 yo F with urethral mass. Histology: This mass is composed of cytologically atpypical spindle cells haphazardly distributed with superficial erosion. There is brisk mitotic activity. Discussion: Primary melanoma of the genitourinary tract is very rare but well documented. The most common site of origin is the urethra and represents less than 1% of all melanomas. It is more frequent in females than males with a female:male ratio of 3:1. Most commonly affects the distal urethra and urethral meatus. In men, more than half of the cases occur in the fosa navicularis, and the remaining are distributed in all different segments of the urethra, including in the prostatic urethra. The clinical presentation includes perineal mass and pain, dysuria, incontinence, hematuria or local bleeding. Occasionally, if the mass is occluding the lumen of the urethra, the presenting symptoms could be voiding dysfunction. One case had the diagnosis of lentigo of the meatus for several years. The clinical presentation might include inguinal lymphadenopathy, due to reactive lymphoid hyperplasia due to infection of the primary lesion of lymph node enlargement due to metastasis. Microscopic Features: Histopathological examination most commonly reveals a polypoid tumor with overlying mucosal ulceration, partially covered with squamous mucosa. Tumor cells may be epithelioid or spindled and can be arranged in nests, or grow in a fascicular pattern and with large pleomorphic cells. The most common pattern of growth is diffuse followed by nested. Prominent rhabdoid features was observed in many cases. Pseudopapillary growth was also reported. Due to surface ulceration, there could be an inflammatory infiltrate. Melanin deposition is not always present. Mitoses and necrosis can be seen. Differential Diagnosis: Epithelioid melanomas should be differentiated from carcinomas. In the urethra, the most frequent carcinomas include squamous and urothelial. Spindle cell melanomas could be misdiagnosed as sarcomatoid carcinoma. Neoplastic cells can show reactivity for or more of melanoma markers including Melan-A, HMB45, SOX10, MITF, MART-1 and S100 protein. Markers of urothelial or squamous differentiation including high molecular weight cytokeratin, p63 or GATA-3 are usually negative in melanomas. Metastatic melanoma to the urethra is rarely a clinically significant finding but it should be considered within the differential diagnosis. Of the patients included in the largest case series published, 2/15 (13%) had history of another melanoma in other location but were thought to have a new primary in the urethra. Diagnosis: Almost invariably, the diagnosis of primary melanoma of the urinary tract involves the use of immunohistochemistry stains to prove the melanocytic origin of malignant cells. These markers include HMB45, Melan-A, MART1, MITF1, S100, SOX10. 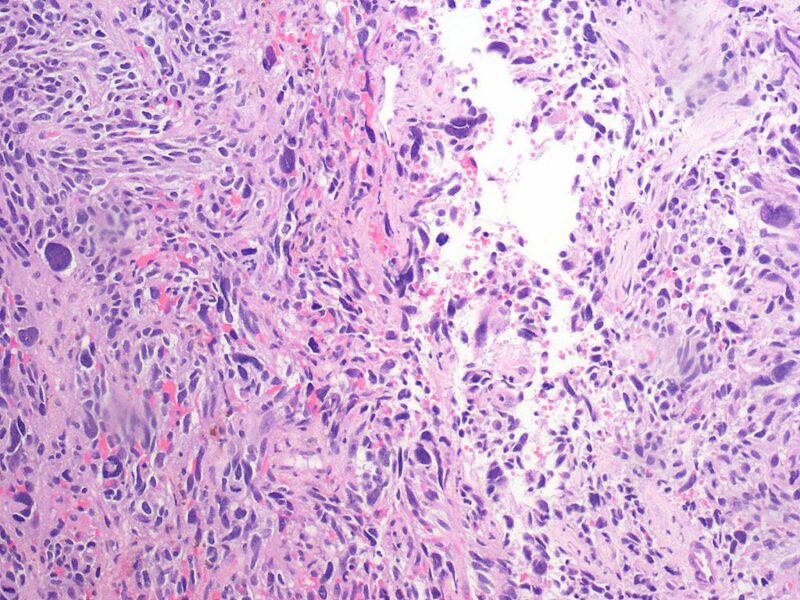 Due to its rarity, there are no well-established guidelines of histopathologic parameters that are expected to be included in the pathology report. Some basic information that should be mentioned in the report include size, depth of invasion (pathologic stage), vascular or perineural invasion, mitotic activity and distance to margins. Prognosis: Overall, primary melanoma of the urethra has a poor prognosis with high recurrence rates and systemic metastases. The management options include radical urethrectomy followed by radiotherapy and/or systemic chemotherapy. A study that investigated mutations in genitourinary melanomas in women identified one of five urethral melanomas with an NRAS mutation and none with a KIT or BRAF mutation. 1. McComiskey M, Iavazzo C, Datta M, et al. Balloon Cell Urethral Melanoma: Differential Diagnosis and Management. Case Rep Obstet Gynecol. 2015;2015:919584. 2. DeSimone RA, Hoda RS. Primary malignant melanoma of the urethra detected by urine cytology in a male patient. Diagn Cytopathol. 2015;43(8):680-682. 3. Dasgupta T, Grabstald H. Melanoma of the Genitourinary Tract. J Urol. 1965;93:607-614. 4. Bhutani N, Kajal P, Pawar D. Primary malignant melanoma of the female urethra: Report of a rare neoplasm of the urinary tract. Int J Surg Case Rep. 2017;41:319-322. 5. Oliva E, Quinn TR, Amin MB, et al. 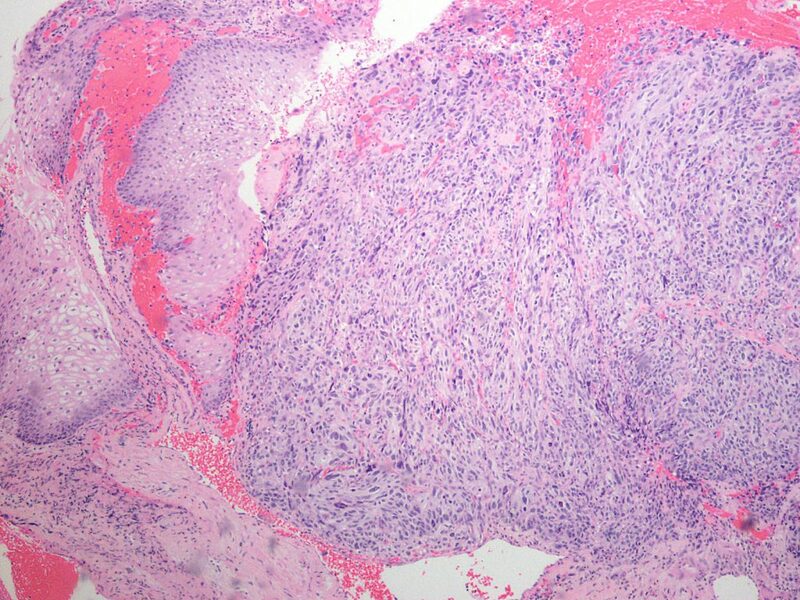 Primary malignant melanoma of the urethra: a clinicopathologic analysis of 15 cases. Am J Surg Pathol. 2000;24(6):785-796. 6. Heslinga JM, Lycklama a Nijeholt GA, Ruiter DJ. 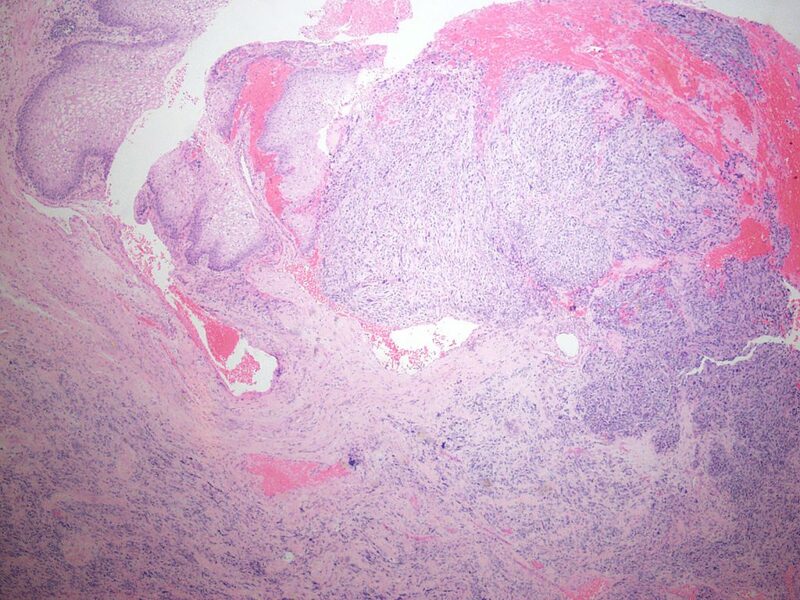 Primary melanoma in the female distal urethra. Eur Urol. 1986;12(6):446-447.